Overview - In Les cousins, Claude Chabrol (Les bonnes femmes) crafts a sly moral fable about a provincial boy who comes to live with his sophisticated bohemian cousin in Paris. Through these seeming opposites, Chabrol conjures a piercing, darkly comic character study that questions notions of good and evil, love and jealousy, and success in the modern world. A mirror image of Le beau Serge, Chabrol's debut, Les cousins recasts that film's stars, Jean-Claude Brialy and Gérard Blain, in startlingly reversed roles. This dagger-sharp drama won the Golden Bear at the Berlin Film Festival and was an important precursor to the French New Wave. For some people life simply comes easy. Friendships, women, money, success, it all arrives naturally, with a mere snap of the fingers, letting such lucky individuals drift through their days in a haze of nonchalance and frivolity. For others, though, existence is not always so uncomplicated, and achievement takes hard work, effort, and investment, both physical and emotional, all resulting from a possibly misplaced sense of duty and responsibility. It is two such individuals, one an irresponsible, womanizing rogue, and the other an innocent, hardworking romantic, that Claude Chabrol's film, 'Les Cousins', focuses on. A kind of reverse companion piece to his previous debut effort, 'Le Beau Serge,' the movie furthers the director's interest in dueling personalities and the sometimes tragic conflicts that arise from such mismatched pairings. Where 'Le Beau Serge' features a young man returning from the city to visit his small village home, here the story follows a character coming from the country to live with his bohemian cousin in Paris. Actors Gerard Blain and Jean-Claude Brialy re-team with the director and essentially swap the roles they played in the filmmaker's previous effort, with Blain becoming the naïve but earnest Charles, and Brialy inhabiting the charismatic but selfish Paul. At first the two seem to get along well enough but soon a woman, Florence (Juliette Mayniel), enters the picture and stirs up conflict between the two cousins. What follows is an interesting examination of attraction, love, and jealousy. The story itself is rife with interesting observations and developments and once again the contrast between Blain and Brialy's characters becomes paramount to the drama. Charles falls in love with Florence first, but Paul simply can't let the poor boy have her. During a party scene Paul witnesses the two kiss for the first time, and his expression of sadness and longing at the sight speaks volumes, revealing a shallow man who may secretly long for meaningful love -- something that he may in fact be incapable of. Though almost everything comes easy for him, this one aspect of life seems to escape Paul, and it leads to betrayal and cruelty. Conversely, Charles seems to go too far on the other side of the spectrum, and his dedication to studies and his polite, non confrontational demeanor end up pushing all of his anger and baser impulses down, where they simmer and boil until the climax. Chabrol really comes into his own as a filmmaker here, and his stylistic form is much more refined and assured. Long takes are again a common feature, but camera movements are much more frequent and deliberate, adding new layers to the proceedings. Connections are drawn through pans and tracking shots, reframing the image to create subtle hints of meaning and insight. One scene features Charles receiving a phone call from Florence. It starts with a two-shot of both cousins in frame, but as Charles begins his conversation, all lit up with excitement, the camera slowly closes in on him, completely cutting a clearly jealous and disheartened Paul out of the shot. Little formalistic touches like this add some depth and purpose to the camera movements, allowing Chabrol to imply significance through his visual choices. Similarly to 'Le Beau Serge' panning and dolly movements during conversations also serve to reveal subtext, with shots reframing on different characters' sides in order to highlight shifting personal dynamics. Several scenes feature crowded parties and Chabrol absolutely litters the frame with activity, allowing the viewer to pick out little details through the various planes of his tracking shots, adding layers of action that bolster visual excitement and authenticity. Like 'Le Beau Serge,' 'Les Cousins' shows Chabrol at the start of his career, but this film features a more confidant and interesting visual style that is bolstered by more natural and polished performances. As jealousy leads to tragedy, we are left to question the perils and merits of hard work in relation to carefree abandon, of superficial escapades in contrast to deeper attempts at love. Differing lifestyles clash and spark, showing that perhaps such varied worlds are not meant to collide. More in line with the stylistic trappings of the French New Wave, this is an interesting and very worthy effort from the director. 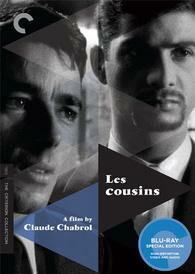 Criterion brings 'Les Cousins' to Blu-ray in their standard clear case with spine number 581. The BD-50 region A disc comes packaged with a booklet featuring an essay by film critic Terrence Rafferty and pieces from Jean-Claude Brialy's memoirs pertaining to Gerard Blain. The movie is provided with a black and white 1080p/AVC MPEG-4 transfer in the 1.33:1 aspect ratio. While not quite as impressive as its companion piece, 'Le Beau Serge,' this is still a very strong video presentation that looks great on Blu-ray. The print is in really good shape with no major signs of age or damage. A light layer of grain is visible throughout giving the picture a nice, authentic film quality. Detail can be very good, but the image does have a slightly softer appearance than Chabrol's previous film. The various party sequences look especially wonderful, with lots of visual information occurring in all segments of the frame, reproduced with great clarity and depth. Black levels are nice and inky, most notably in a scene where Paul shuts off all the lights in his apartment and walks around the room, lighting the scene with flickering candles that create a strong display of contrast and shadow. Whites carry a pleasing intensity without blooming. 'Le Cousins' looks great, with a strong and respectful transfer free of any major technical anomalies or inconsistencies. Criterion has done a very nice job here. The audio is presented in an uncompressed French mono PCM track with optional English subtitles. The mix of course shows its age at times, but is certainly serviceable. Dialogue is fairly clean but there is some very minor crackle in a few isolated lines. Effects work within the single channel is minimal, but balance between all of the elements is handled well. The film features some strong uses of classical music, and while the track doesn't feature the most robust fidelity, the score comes through nicely. With that said, there are instances during the party scenes when there is a lot of activity that frequencies sort of start to blur together, demonstrating the limited range of the source elements. Like many mono tracks of this era, this is a decent but not particularly noteworthy presentation. It gets the job done just fine, but there are some noticeable limitations. Audio Commentary Featuring Film Scholar Adrian Martin - This is a decent but not particularly great track. Martin tends to be a little less focused than other Criterion commentary participants, and provides a more broad overview of Chabrol's style and influences. A lot of talk is dedicated to the director's interest in the crime genre and his admiration for Hitchcock. Some discussion is geared specifically toward the film itself, and Martin does provide some worthwhile insights about its themes and cinematic techniques. While not essential listening, big fans of the movie or the director should certainly check it out. Theatrical Trailer (HD, 4 min) - The film's theatrical trailer is presented in 1080p with Dolby Digital mono sound and English subtitles. 'Les Cousins' is an interesting early film from the French New Wave. Through his examination of jealousy and love set to the backdrop of bohemian frivolity, Chabrol presents a more refined cultivation of his visual skills that features some strong performances and interesting filmmaking techniques. The video transfer is very strong and the audio mix is solid. Supplements are disappointingly sparse, but the commentary is fairly informative. Though a pretty light effort from Criterion, this disc still comes recommended.